have seen so many beautiful ones. Today's idea is a couple of simple Valentine banner cards. Yikes, no stamping, except for the sentiments! This simple card was made with a black card stock base, a hot pink dotted mat, and three banners cut from white card stock. I decided how many banners I wanted and how long I wanted them. Embossed each one with a different embossing folder, from left to right, Cuttlebug, Couture Creations (Venus Crest), Darice. I stacked them all together and cut the bottom all at the same time so they would all be alike. Adhered them to the designer paper mat. Ran a ribbon around the mat, tied a bow off-side, and secured the mat to the base card. Stamped the sentiment, Stampabilities (QR1053). Added a small punched heart to the center of the bow. part of the strip, cut across just leaving the top of the heart shape in place. embossed using the stripes from the Tim Holtz , Alterations, 4th of July embossing set. Lots of possibilities with this simple application. 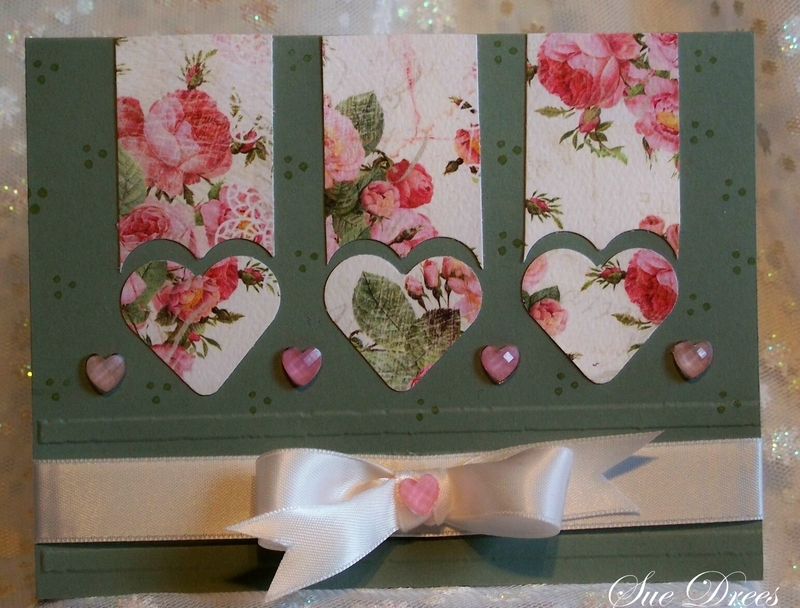 On the second card, you could use butterflies, flowers, perfect for Spring cards, or snowflakes would be fun too. Banners can be any size, or a combination of sizes on one card. And you could run them from side to side instead of up and down! Hope you have a chance to try a card soon using this fun banner technique! wow two beautiful cards Sue. 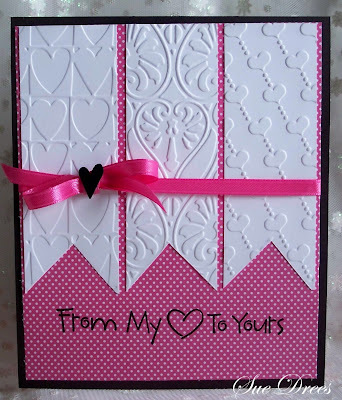 Beautiful, love the embossing, it is all very classy!